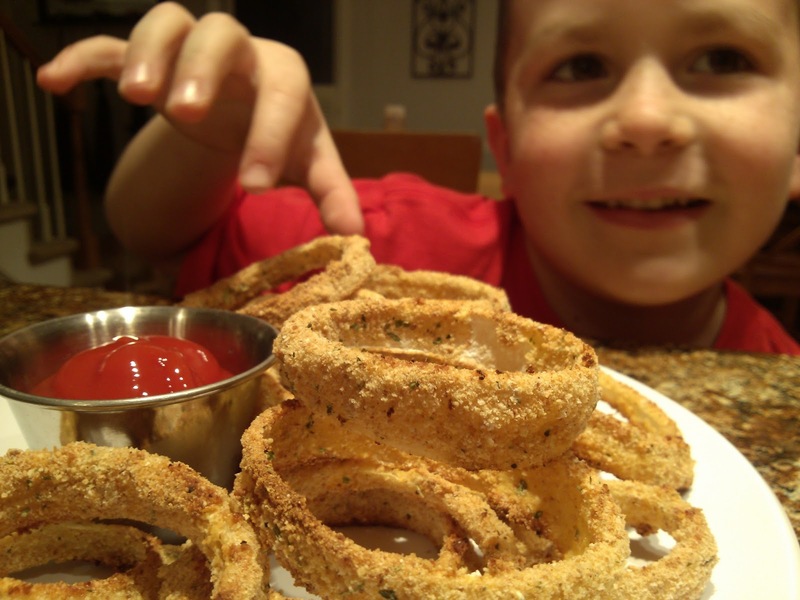 Crunchy, crispy baked onion ring recipe made in the oven. 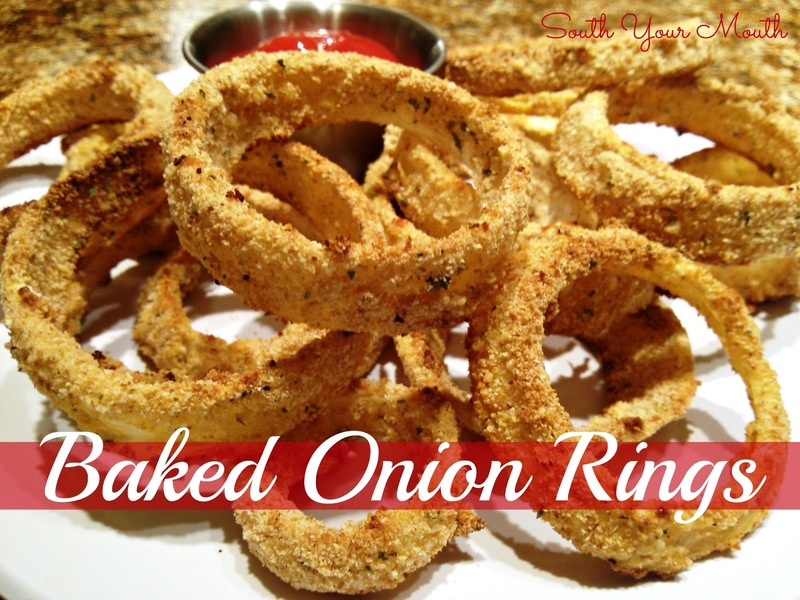 Since we were having the ultimate in junk food for supper the other day (White Trash Sliders), I decided to try a healthier alternative to the chips I was seriously considering serving so I decided to try my hand at baking onion rings. Plus I had these HUGE white onions that were calling to me to make something with them. As soon as I started cutting into the onions, my eyes filled with tears and my nose started running. Like, bad. I tried every trick I knew to make it stop but it just wouldn't let up. Not wanting to touch my face with the onion juice all over my hands, I just kept sucking snot and blinking tears and mumbling my tirade behind Husband’s back until I was done with the blasted things. Once I got the onions in the oven and got myself cleaned up, I walked into the living room to find one of MY onions sitting on the couch crying! Whuck?? I asked what in the world was wrong and Brutus falls into a million pieces and begs me and Daddy to stop fighting. WHAT THE?!?! Husband and I have never fought in front of the kids. We rarely fight at all but when we do it’s always waaaaay overdue and I usually end up breaking stuff so we do a really good job at never going there around the kids. And then it occurs to me what he’s talking about. He sensed the disturbance in the force earlier and then suddenly I’m “crying” and mumbling under my breath like a crazy woman. I went and got Husband and we both explained to him that we weren't fighting, that we love each other dearly and blah, blah, blah but he still didn't look convinced. So I went into the kitchen, chopped one of those big fat onions in half, brought it into the living room and shoved it under his nose. His eyes began to water and turn read and his nose started to run and I was able to explain to him that was all was wrong with me. That I wasn't really crying. Separate onion slices into individual rings. Add cornstarch to a small bowl; set aside. Mix breadcrumbs with salt in a small bowl; set aside. Whisk together egg, hot sauce and milk in a small bowl until thoroughly combined; set aside. Spray a 17x24 baking sheet (or two standard-size cookie sheets) with cooking spray. 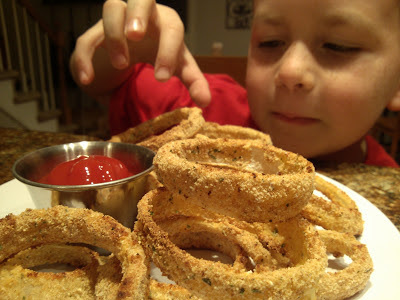 Working in an assembly line fashion, dredge each onion ring first in the cornstarch, then the egg wash, then the breadcrumbs. Place onion rings in a single layer on the baking sheet. Spray onion rings lightly with additional cooking spray (helps them crisp up a bit) and bake at 400 for 20 minutes or until golden brown, flipping onions rings after 10 minutes of cooking time. Sounds like a delicious alternative. These look beautiful! I'm bookmarking them to give a try. I'll check it out! Thanks for the invitation! LOL - LOVE your stories (and your recipes)! sooo glad I found this site..love it! 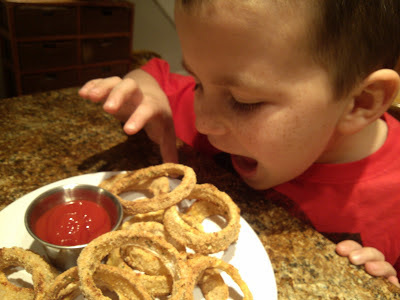 !, and onion rings without the fat of deep fry...YES! !..have to try it!!! Cute story about the onions! Loved it and will definitely try the onion rings! I wonder what your boy was thinking when he saw you coming at him with that onion. You crack me up and this recipe sounds easy and delish! I had both cat and child who were certain we were going to explode or something, the child managed to get over it by the time she was 8 or so, the cat never did, he'd run around our feet hollering about us hollering. We'd stop to reassure the cat, and wind up talking it out like normal people, and strichnine and knives, hammers and other items of mayhem were mentioned frequently. But the neighbours did it outside and got physical, was glad when we moved.